Any card is freely selected by a spectator. That card is then lost in the deck. That card magically rises to the top. And then the ENTIRE DECK BECOMES THE SPECTATOR'S SELECTED CARD! SELF WORKING and requires almost NO SKILL! EASY. 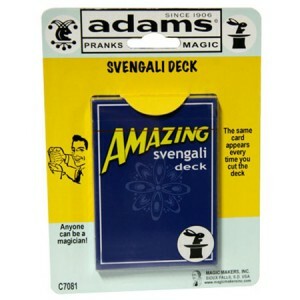 Countless magic effects can be performed with this Amazing Svengali Deck. Free online teaching support is included. First marked by Burling Hull in 1909. Still to this day, the most used trick deck by the magic performer!